What a great opportunity to teach my son something incredibly valuable: how to make believe, otherwise known as pretend or imaginative play. During pretend play, children use their imaginations to recreate and reenact their world around them. 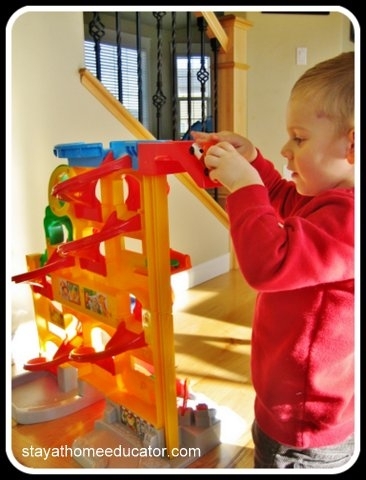 Pretend play involves extensive amounts of planning, organization and memory skills. It teaches children sequence, how to work with others and compromise, how to creatively problem solve and communicate. When William and I pretend play, he assigns characters to each of us. I get to be Thomas the Train, or the moving van or ice cream truck. Whatever toy William gives me, he organizes our play. Today, the ice cream truck needs repairs. He tells me that I need a wrench or pliers, and maybe a hammer to fix the moving van, even though he is the one pretending to do the fixing. 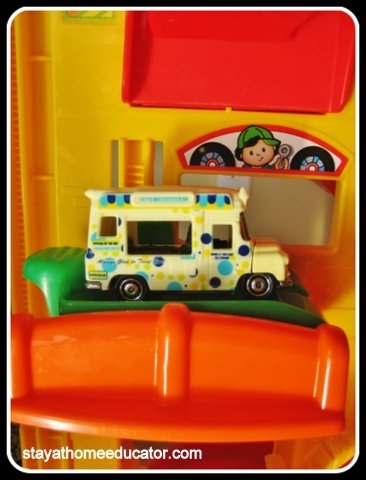 He twists and taps the ice cream truck until it is fit for the road again. When he is finished, he follows up with, “That feel better, Mama?” and we zoom off down the speedway ramps. Next, we find ourselves running low on gas, so we stop to fuel up, but have to wait our turn. A moving van is gassing up ahead of us. Now that the tanks are full, we head off to the dive through where William’s street sweeper orders “French fries, soda, and blueberries,” (all his favorite foods, of course). He assigns a dollar amount to pay for the food, which usually sounds something like, “five four ninety-seven three, please.” William makes a clicking sound as he pinches his fingers as though he is dropping money into the cashier’s hand. Then we find ourselves zooming off to the parking lot where we stop and William’s street sweeper shares some of his lunch with my moving van. 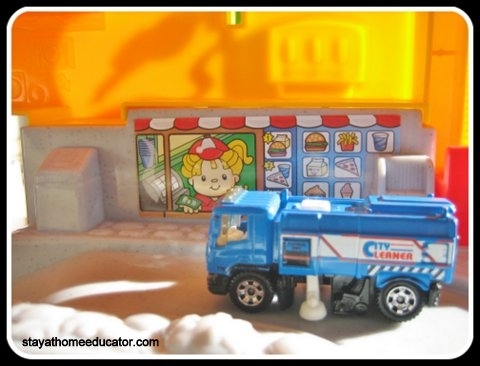 And out of the blue, William quotes from one of our favorite books, “The…most powerful truck isn’t the street sweeper…It not big, Mama.” (The Mighty Street Sweeper, by Patrick Moore). 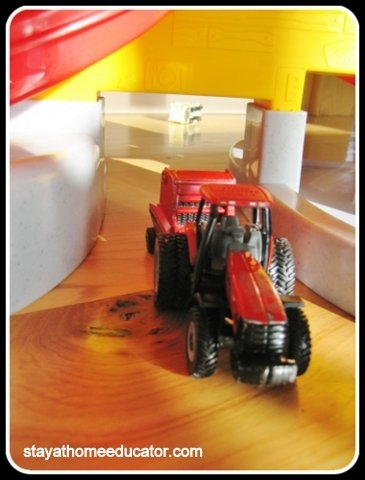 Finally, at some point during our pretend play, William puts his tractor in time out. Throughout the course of our play today, William recreated circumstances that were familiar to him. He reasoned and organized our play into sequenced events. His experience of helping his dad repair things around the house translated to fixing the ice cream truck, watching me use cash for purchases was recreated by the way he pretended to give coins at the cashier’s window, and even my disciplining tactics were apparent when the tractor went to time out, (although I don’t remember why the poor tractor was deserving of time out). 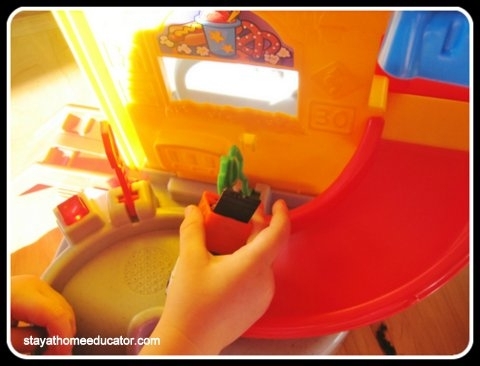 There are several ways to encourage pretend play. First of all, set the stage. 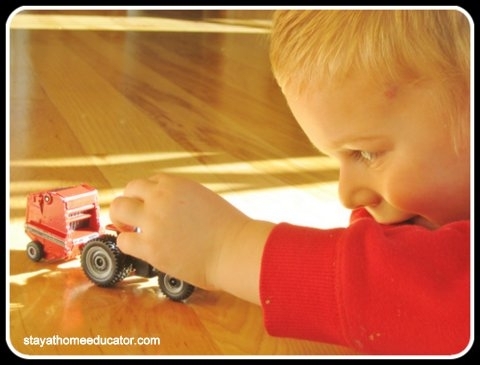 Help your child create a space appropriate for play and let him direct you via his current interests. Get the toys organized so that the specific dinosaur with the blue dots (not the red) can easily be found, and put the little city props in a common location as well. Second, provide props. Discount and dollar stores are inexpensive places to purchase props of all kinds, and of course toys. 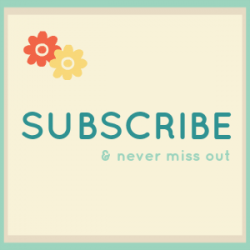 Organize your kitchen, and the rest of your home, so that child appropriate props are at child level. Finally, make time to get down and play with your child. 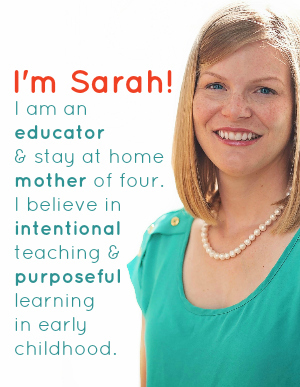 This is such a valuable time to model for your kiddie sharing and kindness. The way you play with your child is most likely the way your child will play with other children. So make the most of it because it is easy, fun, and valuable. 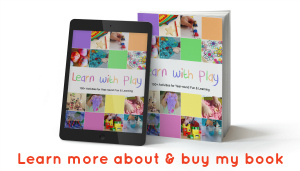 Kids learn so much through pretend play – and I find that I learn so much as a parent, also, when I join in! Fantastic post! They always send their toys to time out! You seem to have a very creative kid.